The view from 30,000 feet and what do I eat? I had the pleasure of speaking at the 2nd International Meeting on Indigenous Women’s Health in Albuqueque last week. Flying there, I connected at LAX and flew east over the arid lands of California, Nevada, Arizona before we descended through cumulonimbus clouds into New Mexico. As we levelled out on final approach, with the airport in sight, the little jet suddenly accelerated and flew high up into the clouds again. We circled Albuquerque for about 45 minutes as the pilot explained that the airport was experiencing “microbursts” which prevented any landings. We had a lovely view of the amazing New Mexico terrain through the clouds as we whiled away our time. Eventually we zoomed off to land in Durango, Colorado where we sat on the tarmac until we had the “all clear” to return to Albuqueque to land. I have flown a lot over the years but his was a first – to see the airport but to be told that we were unable to land. Usually, when we can’t land in British Columbia it is because you can’t see the airport. And, I think these “micro-bursts” are what we call “rain” up here, although ours tends to come in “macro-bursts”. Although it was a three hour delay, it was also an amazing opportunity to see the desert landscape from a perspective where it was clear how the forces of wind and water had shaped the land over millennia. It reminded me of the “rocks for jocks” geology course I had taken years ago as an undergrad at the University of Calgary and how we were taught that advances in geological science occurred quickly after air travel became common. It also makes me think that our reductionist approach to nutritional science would benefit from a perspective that looks more holistically at the contours of the problems we face. For example, when you look at the shape of the obesity epidemics that are sweeping the world, how can you conclude that we are on the right track with our prevention efforts which are based on the calories-in/calories-out paradigm? You can’t. I was at a meeting in New York a couple of months ago where I had a conversation with a Finnish colleague who was in the business of health promotion. They are proud of the success of North Karelia where cardiovascular disease risk was dramatically improved, apparently through a concerted health promotion effort using the conventional ideas of low-fat calorie restricted diets for weight loss, more fruits and vegetables, etc etc in the 1970s. They also promoted smoking cessation and there is evidence that other areas that didn’t embark on a similar campaign actually saw similar improvements, but, nevertheless, North Karelia is held up as a shining example of how the consensus approach to diet is the correct approach. How can you argue with those results, right? Well, the question I had for my colleague was, “If North Karelia showed us the simple solution to how these problems could be fixed over four decades ago, why hasn’t this approach been used to fix the problem everywhere else in the intervening years?”. Of course, she had no answer. I am told that there was a television documentary produced in Finland a couple of years ago which was basically an expose of the fallacies of the North Karelia story. Unfortunately, it is not available in english as far as I know. My ordeal in getting to Albuqueque was worth it in the end, though. My “Big Fat Diet” talk was well received and I was swarmed with people asking questions and seeking copies of my slides. I was asked to host a small round-table discussion later in the program, and, again there was enthusiastic interest in what a low-carb high-fat diet can offer to those who struggle with excess weight and the metabolic problems associated with insulin resistance. One of the questions I was asked there and that I get asked wherever I lecture is “what do you eat?”. It occurs to me that I should add some slides to my powerpoint presentation to provide the answer. I thought you might like to see some examples here. These are photos of a couple of typical dinners, a typical breakfast and my usual lunch. I have added a photo of a birthday cake I made for my son’s eleventh although it is not something we eat that often. I will add a photo of my low-carb organic chocolate pecan ice-cream the next time I made a batch. In the meantime, feel free to share these photos with any naysayers you encounter who try to tell you that a low-carb diet is too boring and restrictive to sustain. This is my usual breakfast these days. 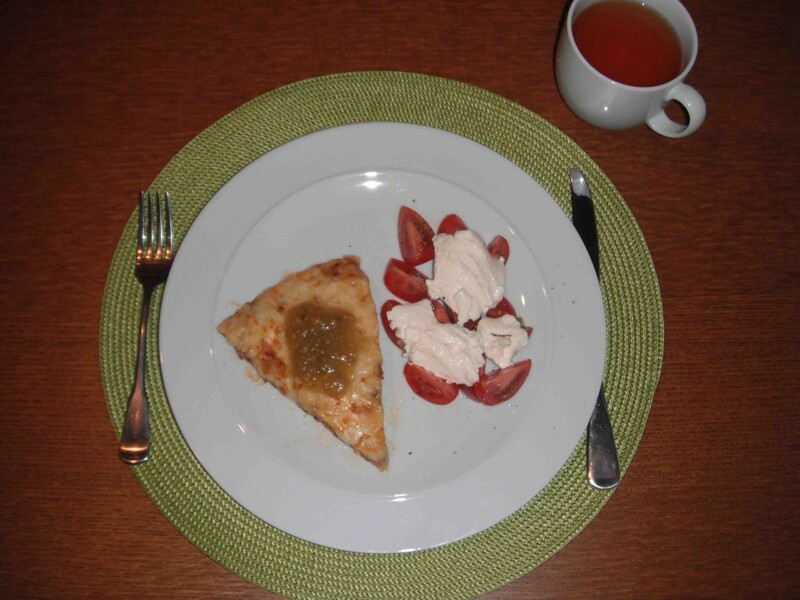 Frittata made with eggs, cream, bacon, mushrooms, onion, chipotle peppers and cheese, topped with some green salsa and accompanied by fresh tomato with mayo and a cup of hot, black tea. Yum! Lunch at my desk. 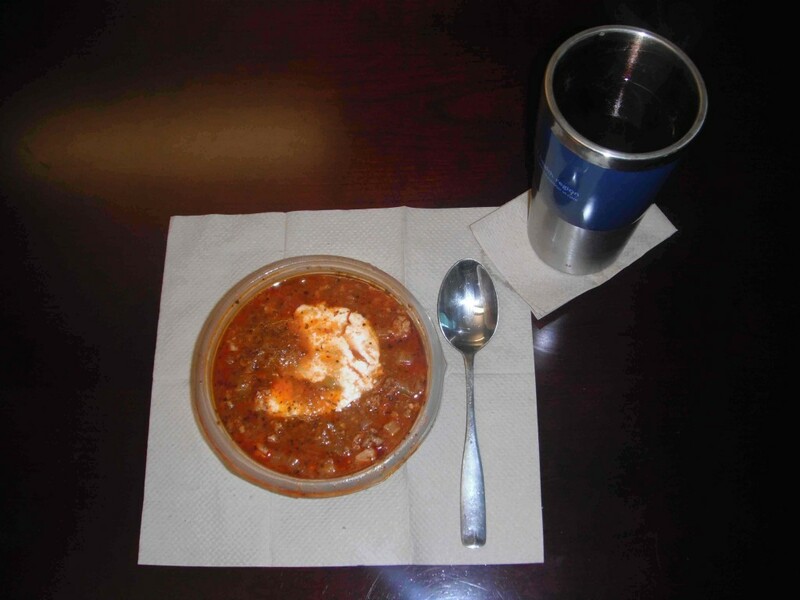 This is my beanless chili. The recipe is adapted from one in "Everyday Paleo" by Sarah Fragoso. It is made with ground pork, ground beef, Italian sausage, Italian tomatoes, chicken stock, onions, celery, basil, oregano, cumin, chili powder, cayenne, salt and pepper. It is delicious served with a dollop of sour cream and some green salsa and accompanied by another cup of hot, black tea. 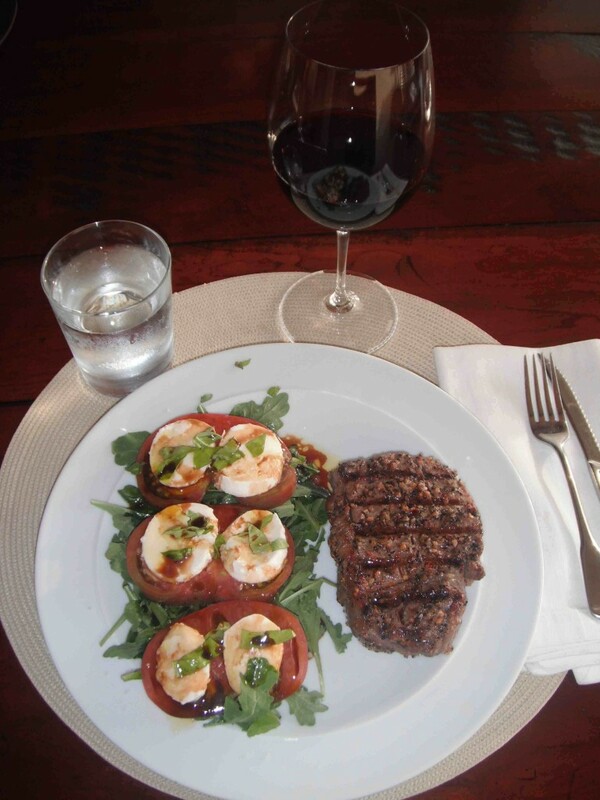 What would low-carb be without the occasional steak? This one was rubbed with olive oil and dusted with Montreal Steak Spice before being grilled. It is served with bocconcini and heirloom tomato on a bed of arugula, drizzled with olive oil and balsamic vinegar with some coarse sea salt and fresh basil. Note the glass of hearty red wine, a must when eating steak IMHO. 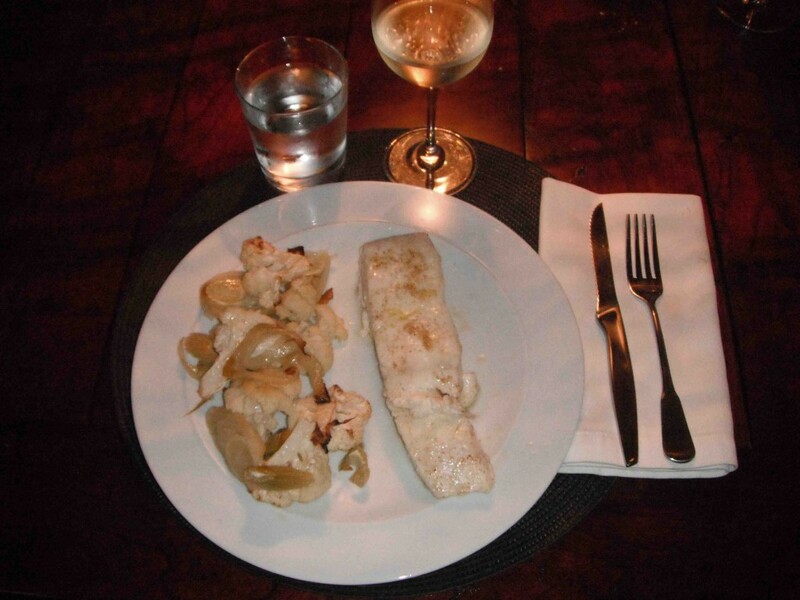 Halibut dinner. On a recent trip to Haida Gwaii, I was fortunate in being able to stock up on halibut. Here it has been rubbed with olive oil and dusted with a little garam masala and then baked in the oven. It is served with roasted cauliflower and anise that had been tossed with olive oil and coarse sea salt. Note that white wine goes with white meat and seafood but that it has more residual sugar than red wine. Having said that, I believe that one little glass is not going to upset the applecart, so to speak. Low-carb birthday cake. 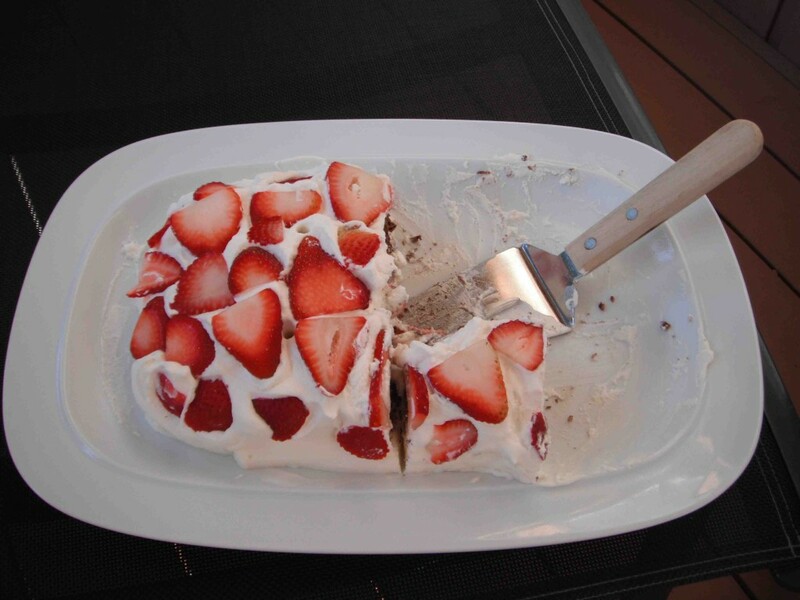 Here is a chocolate birthday cake with whipped cream icing and fresh strawberries that I made for my son's eleventh birthday. The recipe is adapted from the one-minute chocolate cake recipe you can find on the recipe tab above. Enjoy!